Earn up to 12,800 reward points. (Open Box) Detailed sampling and smart design along with stylish aesthetics. Williams redefines affordable elegance with the best-in-class Symphony Grand digital piano. 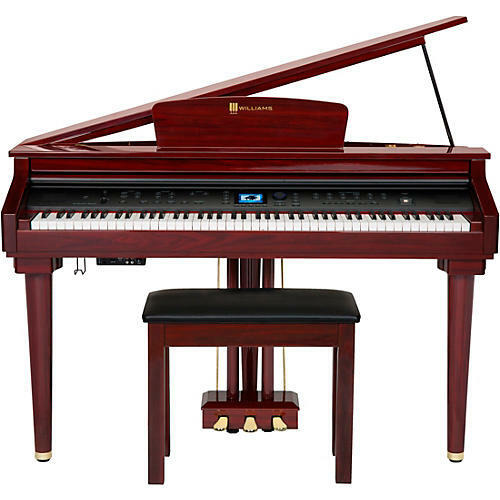 This micro-grand style, 88-key, graded hammer-action instrument offers realistic sound and feel, complemented by a luxurious ebony gloss finish. The newly designed keybed provides an authentic response and playability. The Williams Custom Sound Library the Symphony Grand uses is designed around a wide collection of high-resolution instruments taken from a famed Italian grand piano, as well as vintage electric pianos and organs. There are a total of 174 voices, including 128 General MIDI sounds and 46 from Williams’ high-definition Custom Sound Library. The Symphony Grand also offers realistic piano effects, such as adjustable pedal noise, key noise and a sustain layer that reproduces sympathetic resonance; plus, the Mod/FX feature gives you authentic rotary effects on organs and vibrato on electric pianos. There are 120 Styles in various genres for realtime playback, along with intros, fills, variations and endings for interactive performance. For education, the Song Tutor teaches the player various types of classical, rock, and blues songs. And for even more in-depth lessons, Williams has partnered with McCarthy Music for cloud-based piano education with a large online music library for every skill level. Not only does the Symphony Grand support standard USB MIDI and Audio, but it also includes Bluetooth bi-directional MIDI connectivity computers and tablets — no need for costly cables and adapters. Just pair it with your MIDI supported device and you’re ready to go. Also includes a USB Host port that plays MIDI files from a USB thumb-drive. Additional features include split/layer, transpose, two-track recorder, metronome, headphone and stereo out jacks. Includes a stylish matching piano bench. Brilliant sound and charming style – a perfect addition to your home.